Shuja Nawaz is a political and strategic analyst. He is a Distinguished Fellow, South Asia Center at the Atlantic Council In Washington DC. He writes for leading newspapers and The Huffington Post, and speaks on current topics before civic groups, at think tanks, and on radio and television. He has worked on projects with RAND, the United States Institute of Peace, The Center for Strategic and International Studies, the Atlantic Council, and other leading think tanks on projects dealing with Pakistan and the Middle East. 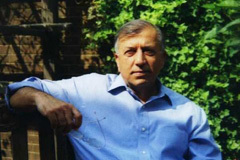 In January 2009 he was made the first Director of the South Asia Center at The Atlantic Council of the United States. 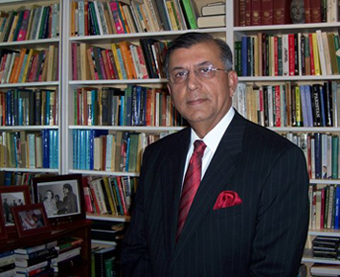 Mr. Nawaz was educated at Gordon College, Rawalpindi, where he obtained a BA in Economics and English literature, and the Graduate School of Journalism of Columbia University in New York, where he was a Cabot Fellow and won the Henry Taylor International Correspondent Award. He was a newscaster and news and current affairs producer for Pakistan Television from 1967 to 1972 and covered the western front of the 1971 war between Pakistan and India as well as President Zulfikar Ali Bhutto’s visit to China January-February 1972. He has worked for the New York Times, the World Health Organization, and has headed three separate divisions at the International Monetary Fund (IMF). He was also a director at the International Atomic Energy Agency in Vienna from 1999 to 2001, while on leave from the IMF. Mr. Nawaz was the managing editor and then Editor of Finance & Development, the multilingual quarterly of the IMF and the World Bank. He served on the editorial advisory board of the World Bank Research Observer. He is the author of Crossed Swords: Pakistan, its Army, and the Wars Within (Oxford University Press 2nd edition 2017). He is also the principal author of FATA: A Most Dangerous Place (CSIS, Washington DC January 2009), Pakistan in the Danger Zone: A Tenuous US-Pakistan Relationship (Atlantic Council 2010), Learning by Doing: The Pakistan Army’s Experience with Counterinsurgency (Atlantic Council 2011), and with Mohan Guruswamy, with a Foreword by former Secretary of State George Shultz India-Pakistan: The Opportunity Cost of Conflict (Atlantic Council 2014). His book of verse in English Journeys was published originally by Oxford University Press and re-issued by Fort Hill in 2017. His second book of verse The Inner World (Archway 2017) is also available on the web. Headed three separate divisions of the International Monetary Fund; was the first Director of a large division of the International Atomic Energy Agency in Vienna, Austria; and a journalist with The New York Times and Pakistan Television news and current affairs division. Also helped launch a monthly newspaper for the World Health Organization in Geneva, Switzerland. He is also an expert in publishing and communications strategies, training, and an experienced editor, who has helped international organizations and firms improve their operations and better disseminate their messages. He has also advised governments in Asia and Africa. Editor and Division Chief Finance & Development, the joint quarterly of the IMF and the World Bank, published in seven languages from seven sites around the world. Designed readership surveys and computerized subscription system. Division Chief, IMF Institute, responsible for managing the administration of training programs in Washington DC and overseas. Set up overseas training centers and helped introduce distance learning. Division Chief, Multimedia Services, responsible for information and knowledge management of the IMF through publishing services, content management, portal, internet, intranet, and extranets. Helped manage first IMF-wide Information Management program. Participated in World Bank and IMF missions to Indonesia, The Gambia and many other countries in Europe, Africa, the Middle East, Asia, and South America. Advisor to the Minister, Dr. Mahbub ul Haq. Produced a study of economic information flows and to how improve them in Pakistan. First Director of a new 200-person strong Conference and Documentation Services division that provided language services, publishing, conference support, and extranet services to the agency and member states. Streamlined operations and introduced technology to expand and improve operations and services. Drafted first publishing policy for IAEA. Helped evaluate and introduce results-based budgeting to the agency. Assistant Editor of WHO Journal, first monthly newsletter of WHO to inform staff in Geneva and around the world of latest developments. Edited, designed, and produced newsletter. Started as copy boy, while at journalism school, ended as Assistant to the News editor; wrote for different sections of the newspaper. Assistant to the head of the United Nations Bureau. Produced news and current affairs programs. First war correspondent for PTV in 1971 on the western front against India. Covered the presidency and President Zulfikar Ali Bhutto’s visit to China 1972 and United States in 1973. Articles in The New York Times, The Boston Globe, The International Herald Tribune, The Washington Post, The American Interest, Foreign Affairs, Foreign Policy, Newsweek (Pakistan), South, Finance & Development quarterly, Asian Survey and other publications. Chapters in numerous books on Pakistan (Oxford University Press) and Third World news in American media (Columbia University). Two books of verse in English. Verse in prominent journals in Pakistan, Europe and the United States. Former member Board of Trustees, and Chair-elect Paul Public Charter School, Washington DC www.paulcharter.org; chair of Marketing and Development committee, responsible for external relations and fund raising. Former President athletic boosters, Thomas Jefferson High School for Science and Technology, Fairfax County, Virginia, USA.